Did you know your chilli? The chilli is actually a fruit pod from the plant belonging to the nightshade family (Solanaceae). Like your common fruit, eating raw chilli will give you a boost of vitamin. Ingredients: Wheat Flour (Contains Gluten) (68.8%), Coconut Oil, Shortening (Coconut And Palm Oil), Curry Flavour, Sugar, Whey Powder (Milk) , Malt Extract, Salt, Raising Agents (Ammonium Bicarbonate, Sodium Bicarbonate), Leavening Agent (Monocalcium Phosphate), Flavour Enhancer (Monosodium Glutamate), Onion Powder, Chilli Powder, Garlic Powder, Red Pepper Powder, Flavourings, Dough Conditioner. 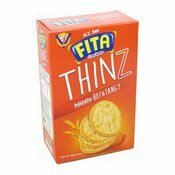 Simply enter your details below and we will send you an e-mail when “Fita Crackers THINZ (Mildly Hot & Tangy) (薄餅辣味)” is back in stock!